Used for Wet-Dry or large Central System Trickle Filters. 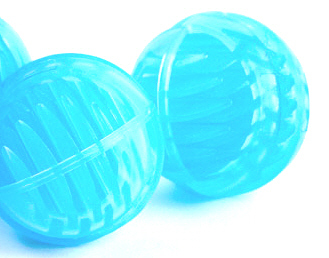 Use the larger ones (1 1/2” dia.) for Central Systems. Good when a more compact media with plentiful surface area is needed such as in Canister filters or air driven box filters. Ceramic rings are porous allowing beneficial bacteria to colonize huge amounts of surface area within the pore structure of this media. 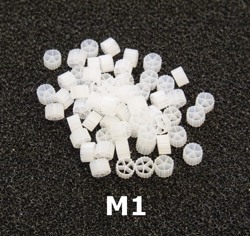 New unique biological filter media for large filters such as used in Central Systems and Pond Filters. Stack vertically and bunch for best flow through characteristics. Will not impede flow with plenty of space to allow flow in high volume systems. Material has minimally porous zones for internal nitrate reduction potential. Can be used in bucket filters with a layer of foam or poly fabric above. AKA; K1 style extruded poly shapes. Bouyant media typically used in flow through filter chambers with supplemental air injection to maintain media movement, self-cleaning action and air saturation for most effective nitrification. Larger sizes are more economical and less prone to clogging for large filters such as Central Systems and Koi Ponds. 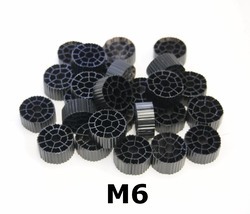 MBM6 is black material for UV stability. Used as media in Box Filters, Canister Filters, Wet-Dry Filters or large Central System Trickle Filters. An inexpensive, easily cleaned media which initially has positive buoyancy but will sink once completely saturated. Micro pores can harbor large quantities of nitrifying bacteria. 2” or 4” long x 1” dia. Filter Pads: used in wet-dry filters and central systems as pre-filter pads or layer from fine to coarsest material for biological/mechanical media use. Matala style woven plastic sheet: Semi-rigid sheet with large surface area of interwoven heavy plastic fibres. Makes a good biological and large pored mechanical filtration material in Pond filters or Central System Filtration. 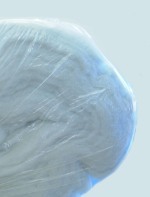 Use a polyester fiber or blue bonded sheet as pre or post filter layer. Will even support moderate weights as a screen layer. Filter Bags: Ring style filter bags for Central System Sumps or Wet-Dry Filters, Pre-filters, - Others available, call. 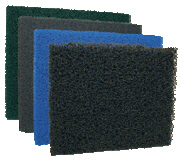 Available in bulk sheet for use as filter pads or custom made sponge filters. 2” and 4” thicknesses available. 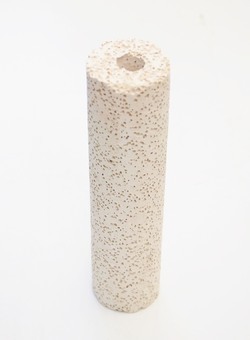 This “Fish Safe” RETICULATED filter foam is the coarse type, better suited to higher flow rates required for pre-filters or any “pumped” system as opposed to the fine pore type of foam used on most air driven Sponge Filters. PLEASE CALL for more info. 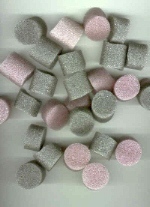 Use this pelletized carbon in aquarium filters for best flow characteristics. Large Pelletized carbon will not create by-pass problems as finer granular carbons will in low pressure systems. Professional Grade Filter Carbon in granular form. Very Clean High Grade Carbon with minimal if any rinsing needed. Bituminous coal based highly absorbtive media. Crushed Oyster Shell Buffer Media: Inexpensive buffering media maintains elevated pH levels. For use in filters, sumps etc. Use media bag w/ drawstring or mesh filter bags below for holding this media. Can also be placed in air driven box filters. LAVA ROCK: Large surface are with many pores to harbor beneficial nitrifying bacteria suitable for use in larger filters or break up into smaller pieces for use in typical filter boxes such as hang-on back filters, canister filters or air driven box filters. Media Bags w/ drawstring: For holding granular media such as carbon, buffers, zeolites, peat, etc. Provides a safe way to pour fish from drip acclimation to net then transfer to tank without co-mingling water. Filter Cartridge housing for use with our Carbon bed cartridges or micron filter cartridge. Can be used to treat incoming tap water to remove chlorine. Useful for top off systems or automatic water changes. Use on pressurized lines such as tap water. Special carbon bed cartridge forces water up through carbon for longest contact time. 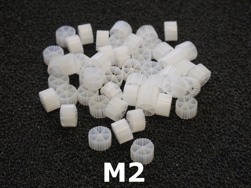 Plastic or brass compression fittings or Garden Hose adapters available. Cartridge Housing w/ 1/4” FNPT fittings. Cartridge Housing w/ 3/8” FNPT fittings. Cartridge Housing w/ 1/2” FNPT fittings. © Copyright 2000-2007 JEHM Co., Inc. All rights reserved.